This issue of the Journal of the American Society of Nephrology contains three interrelated papers from the laboratory of Andrew McMahon, providing a comprehensive analysis of sequential human and mouse kidney development at the macroscopic, microscopic, cellular, and molecular level.1–3 Together, they represent a major contribution to the GenitoUrinary Development Molecular Anatomy Project (GUDMAP), a high-resolution interactive atlas of kidney development conceived in 2003 and funded by the National Institutes of Health.4 Throughout most of the 20th century, developmental nephrology was largely descriptive, and the etiology of congenital anomalies of the kidneys and urinary tract remained unexplained. The impetus for the formation of the GUDMAP consortium was provided by a late 20th century surge in the development of technologic innovations in cell biology, molecular genetics, and cell fate mapping. The rise of evolutionary developmental biology (“evo-devo”) was largely propelled by the discovery of homeobox genes. Many of these advances were on the basis of studies in the laboratory mouse, an organism with a high rate of reproduction, short gestation, genetic homogeneity, and 85% protein-coding homology with the human genome. However, 90 million years of evolution separate mouse and human from a common ancestor (Figure 1). To address this, the investigators of the three articles have meticulously delineated the conserved and divergent features of key stages of kidney development in a large sample of kidneys from both species.1–3 The results reveal deep conservation of nephron patterning between human and mouse, but marked divergence in gene expression patterns and progenitor cell types. 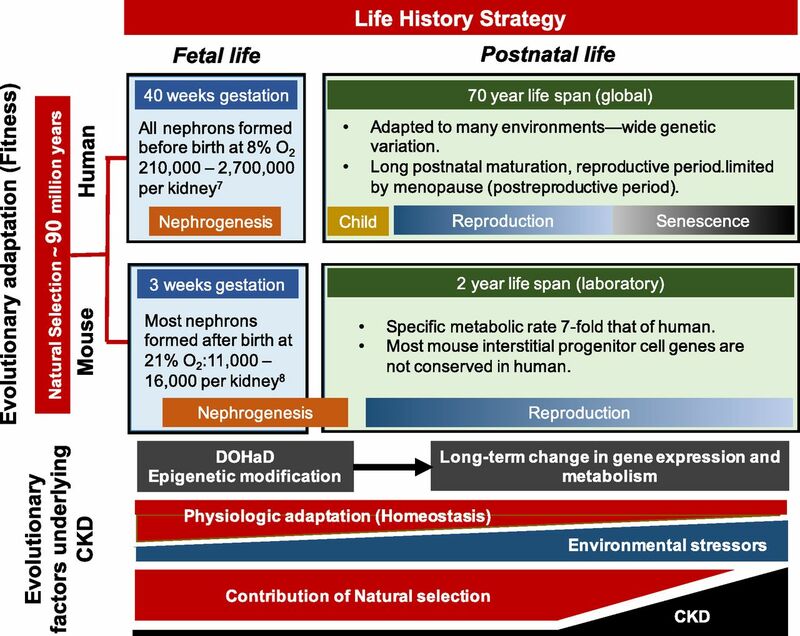 Evolutionary factors play a central role in determining life history strategy, which spans fetal and postnatal life, and underlies differences between human and mouse kidney development as well as the course of CKD. Evolutionary divergence of mouse and human is estimated at 85-94 million years ago, the result of evolutionary adaptation driven by reproductive fitness (vertical axis). Differences in nephrogenesis between species are the product of natural selection over that interval, and reflect evolutionary adaptation to life history strategies spanning fetal and postnatal periods (horizontal axis). Human nephrogenesis is complete before the end of gestation, taking place in an 8% oxygen environment. Murine nephrogenesis begins in fetal life, but most nephrons are formed after birth in 21% ambient oxygen. In contrast to the mouse, the number of nephrons in the human kidney at birth is highly variable and subject to epigenetic modification of nephrogenesis in response to fetal environmental stimuli (developmental programming). A new discipline, the Developmental Origins of Health and Disease (DOHaD), is defining the role of this process in long-term gene expression, with reduced nephron number at birth now recognized as a risk factor for CKD in adulthood. Adapted to many environments with wide genetic variation, human life history strategy includes prolonged childhood followed by a reproductive and postreproductive period (menopause). In contrast, specific metabolic activity in the mouse is seven-fold that of human, a reflection of its small size (greater surface area/volume ratio) and greater metabolic demands. Mesenchymal progenitor cell types and transcriptional profiles are also markedly divergent in mouse and human nephrogenesis. In contrast to evolutionary adaptation, physiologic adaptation (such as nephron hypertrophy following reduced nephron number) is a short-term response that is less robust with advancing age, during which time accumulating environmental stressors also contribute to increasing CKD. Because natural selection is driven by reproductive fitness, its contribution to human evolution is largely limited in late adulthood (senescence), during which nephron number normally decreases by 50%, accounting for a sharp rise in CKD during this period. How do these processes relate to kidney development? A number of studies have suggested that cellular mechanisms underlying these adaptive and maladaptive responses represent reactivation of developmental pathways.14 A likely explanation for such parallels is that the nephron microenvironment produced by injury induces cell signaling pathways that evolved in nephrogenesis. Evolution can be viewed as the unfolding of increasing complexity of cell–cell signaling in the progression from unicellular to multicellular organisms, paralleled by development from zygote to maturity.16 The recognition that cumulative episodes of AKI can lead to CKD, and that CKD is a risk factor for AKI, suggest a role for the proximal tubule as a key player in the progression of kidney disease.17 Packed with mitochondria, and accounting for the bulk of renal mass, this nephron segment is responsible for most of the oxygen consumed by the kidney, and is susceptible to hypoxic or oxidative injury. The glomerulotubular junction is particularly vulnerable to injury, which when prolonged, leads to cell death and the formation of atubular glomeruli.18 This process is activated in the final stages of virtually all causes of CKD, including genetic, obstructive, ischemic, metabolic, immunologic, or toxic etiologies.18 Formation of atubular glomeruli may represent an atavism that originated in a common ancestor with fish that adapted from a freshwater to saltwater environment over 435 million years ago. With increasing age in the sculpin (a marine fish), nephrons undergo progressive degeneration of the glomerulotubular junction, resulting in atubular glomeruli and aglomerular tubules.18 Reversion of a filtering nephron adapted to a freshwater environment to a secretory nephron adapted to a marine environment reduces the large energy required to reclaim filtered solutes; a process that appears maladaptive in the context of CKD, but not in the context of evolution. The risk for CKD is <1% in children, and increases to 40% for those over 50 years of age, after which nephron number decreases by 50%.15,19,20 In postreproductive years, cumulative environmental stressors increase, whereas the efficiency of homeostatic responses and the contribution of natural selection decrease (Figure 1).15 Fetal nutritional restriction accelerates maturation after catch-up growth,21 whereas by conserving energy in the postreproductive period, calorie restriction in the aging rat increases longevity.22 To contextualize developmental mechanisms, CRISPR/Cas9 technology could be applied to nonmodel organisms to study environmental effects on gene expression.23 Consideration of developmental and evolutionary factors in the genesis and progression of kidney disease over the entire life cycle should lead to new therapeutic approaches. Advances in the prevention and treatment of CKD will depend upon the current and future additions to the GUDMAP database: a Rosetta Stone for nephrology. See related articles, “Conserved and Divergent Features of Human and Mouse Kidney Organogenesis,” “Conserved and Divergent Molecular and Anatomic Features of Human and Mouse Nephron Patterning,” and “Conserved and Divergent Features of Mesenchymal Progenitor Cell Types within the Cortical Nephrogenic Niche of the Human and Mouse Kidney,” on pages 785–805, 825–840, and 806–824, respectively.